Early November can be gloomy at the best of times and these aren’t especially the best of times. 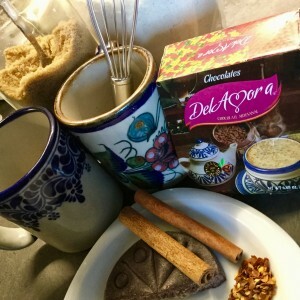 So here’s a comforting recipe for Champurrado, a thick, warming Mexican hot chocolate. The thickening agent is masa harina, the corn flour traditionally used for making tortillas, giving the drink an unusual corn flavour. The masa marina and the Mexican chocolate are both available from us at Caoba. 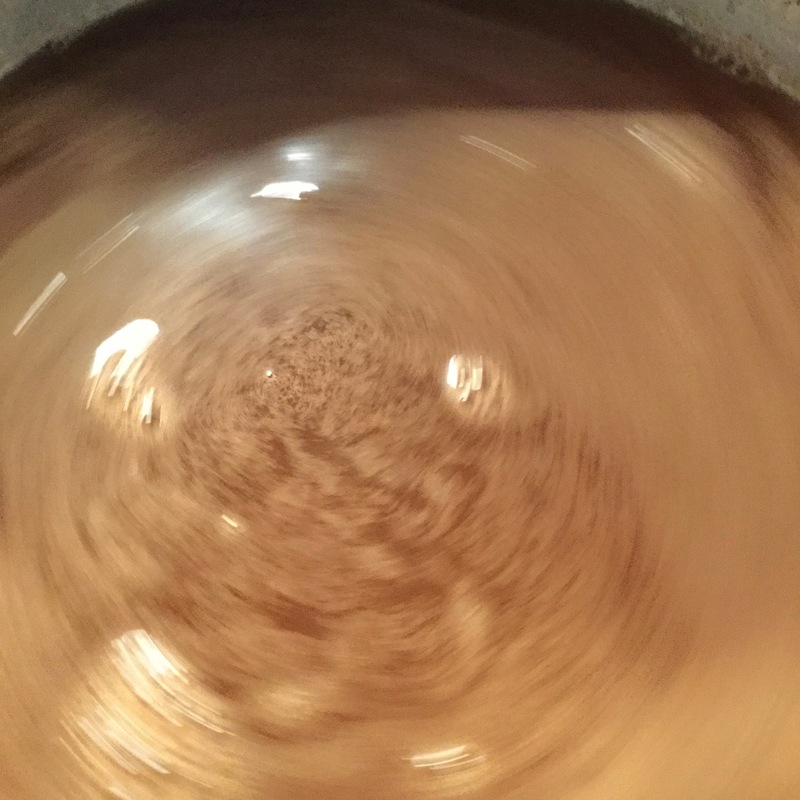 Heat the liquids in a saucepan over a medium heat until lukewarm. 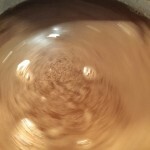 Add the chocolate pieces and whisk until dissolved. Add sugar and if you fancy it a tiny pinch of dried chile flakes. Increase the heat under the pan to high, continue whisking briskly while slowly adding in the masa marina. Keep whisking to prevent lumps forming. Once the mixture has thickened (about 8-10 minutes) remove from the heat and pour into your favourite mug. Ours are these hand painted stoneware mugs. Pop the chocolate disc into a plastic bag and beat with a rolling pin to break it up. You can use any type of milk, or non-diary variant, or just water depending on the level of richness you want to achieve. 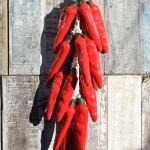 Some recipes also flavour with a little star anise and/or salt. I added the chile flakes because I am addicted, but I don’t think it’s traditional. This entry was posted in Recipes on November 10, 2016 by admin. The traditional Mexican day of celebration El Día de los Muertos is coming to Caoba. While we never turn our noses up at a good Halloween party, November 1st, El Día de los Muertos is a special time of year. We usually mark the day in some way, with special bread and cookies, even making our own sugar skulls. 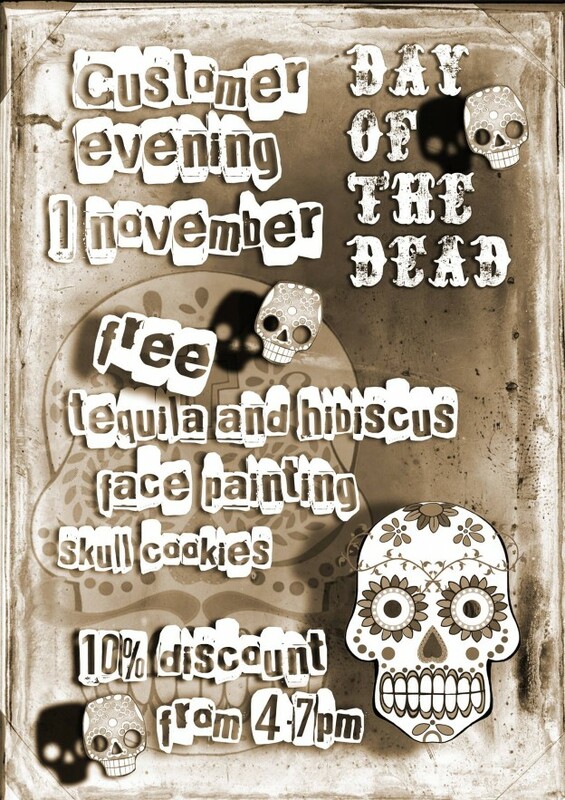 This year, Tuesday 1st November we are inviting our Edinburgh-based customers to join us in-store for some fun with face painting (not just for children), tequila (definitely just for adults), cookies and a 10% discount. All from 4 until 7pm. 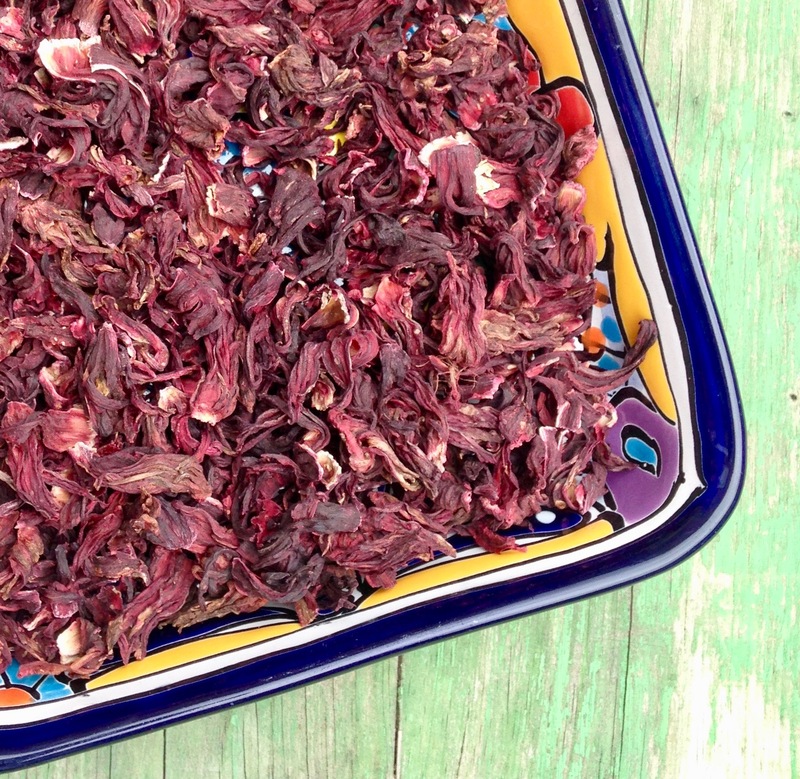 We will be serving our tequila flavoured with a hibiscus syrup. Try making some yourself as a refreshing change from the ubiquitous lime. 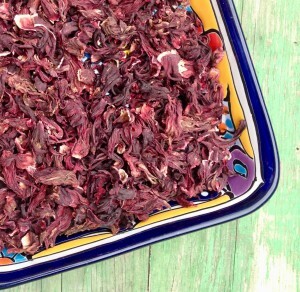 Mix 5g dried hibiscus flowers, 250ml water and 100g of sugar in a saucepan and bring to the boil. Stir to make sure all the sugar has dissolved and remove from the heat. You can either leave the syrup to infuse for a few minutes to strengthen the colour and flavour or strain straight away. Add tequila* to taste. The syrup works well on its own over ice too. This entry was posted in Day of the Dead, Recipes, Useful Info on October 28, 2016 by admin. 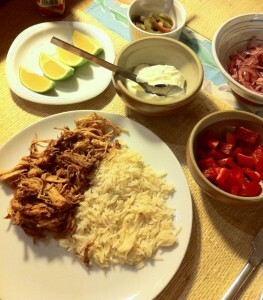 Slow Cooking a Winter Warmer: A Scottish recipe for Mexican Pulled Pork. We’ve been cooking up a storm here at Caoba Towers*. Our most recent venture into Mexican food was a pulled pork dish, known variously as Achiote Pork, Mexican Pulled Pork or Cochinita Pibil. There are hundreds of different recipes if you search on sites such as Pinterest; most of them using American measurements, some requiring a barbecue pit in the back yard. This meant a little experimentation to accommodate our location in Edinburgh, Scotland. 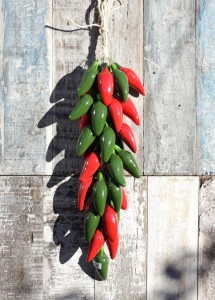 What follows makes no claims for being authentically Mexican but it will definitely warm you up! The key ingredients are pork shoulder, citrus juices and achiote powder or paste, marinated over night and slow-cooked in a low oven or a slow cooker/crock pot. After that you can pretty much make things up as you go along if you are so inclined, otherwise use the following recipe as a guideline. 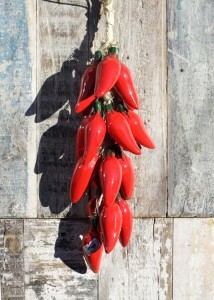 Achiote (also known as annatto) can be bought locally from Lupe Pinto’s, or is available from various online stores. The paste is a mixture of achiote powder and other spices, so omit the first step in the recipe if that’s what you’re using. Mix the ground spices and garlic together, adding in some of the citrus juices to form a thick paste. Score the pork with a sharp knife and rub the paste into the surface of the meat. Place the meat in a glass or ceramic bowl (not metal) and pour over the remaining citrus juices. Cover and refrigerate overnight or for at least 4 hours. Place the pork in an oven-proof casserole dish or the slow cooker pot and strain over the marinade. Season with salt and add more juice or water (if necessary) to the depth of about 5cm. If you are using the oven make sure the casserole lid has a tight seal, you don’t want any steam to escape or the liquid to dry out. Cook in a low oven 140°C/Gas 1 for about 5 hours. If you are using a slow cooker use the low setting and cook for about 8 hours. Once the meat is fall-apart tender, remove from the oven/cooker, drain and pull apart using 2 forks. Set the meat aside, keeping warm. 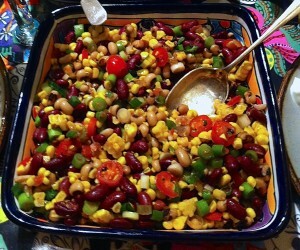 Serve with rice and some of the cooking juices or wrap up in warm, soft corn tortillas. 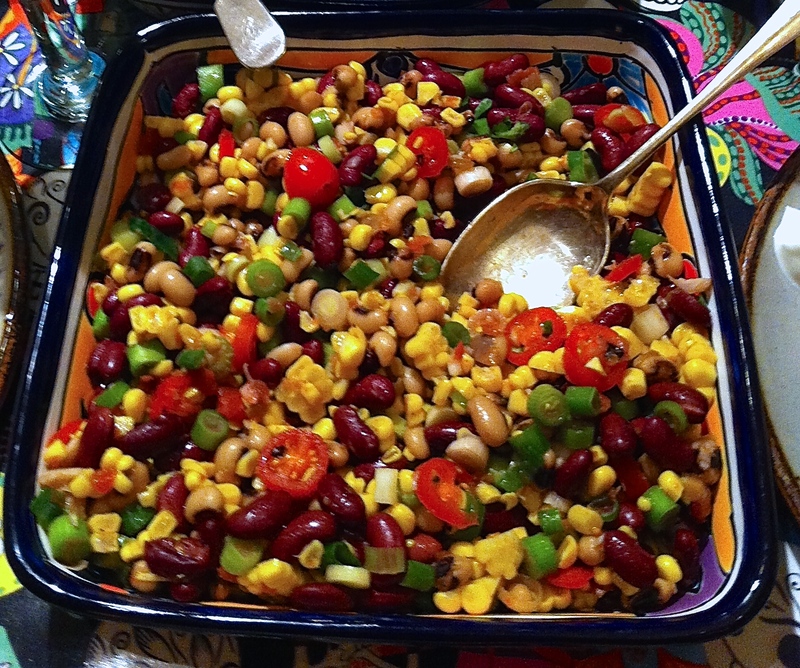 Good side dishes are guacamole, bean salad, salsa or sliced jalapeño peppers or pickled red onions. 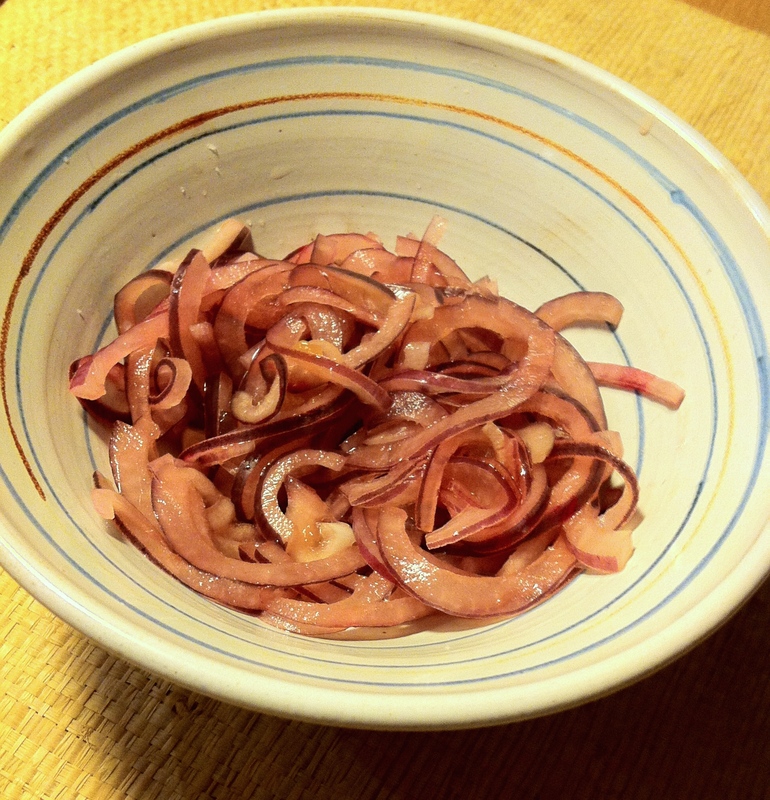 NOT pickled onions from a jar; a finally sliced red onion pickled in lime and orange juices to cover, with 3 tsp sugar and 1 tsp salt added. Covered and left to pickle for at least 2 hours. I repeat, not pickled onions from a jar. 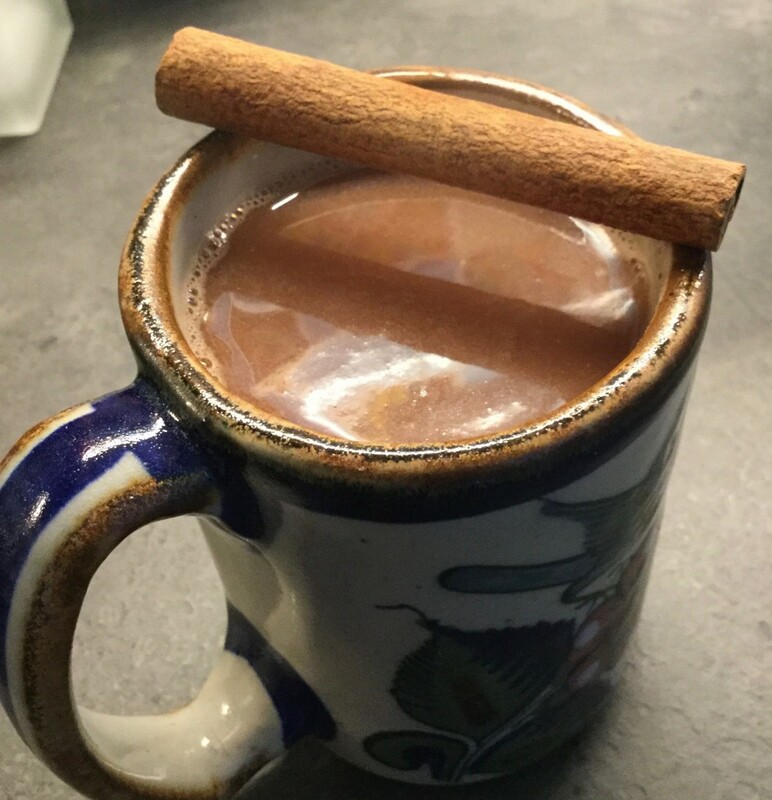 This entry was posted in Recipes on February 6, 2015 by admin. 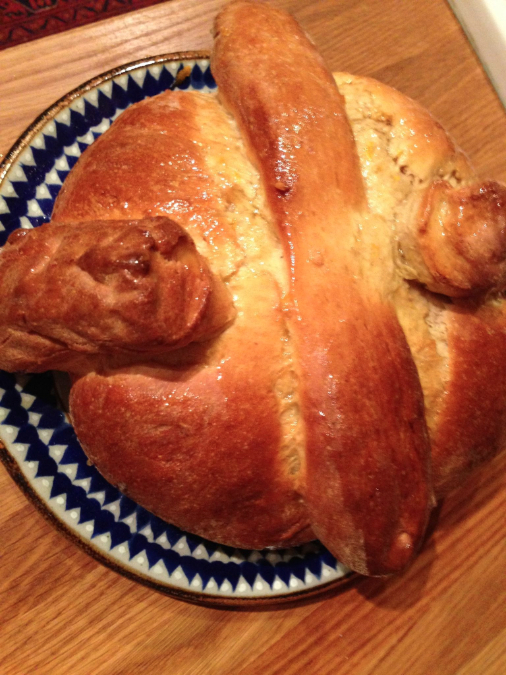 In Mexico the sweet loaf Pan de Muerto is as much part of the celebrations for the Day of the Dead as mince pies are part of Christmas. Preheat oven to 180 degrees Celsius (350 degrees Fahrenheit ), gas mark 4. Combine half the flour (reserve the rest), sugar, yeast, salt and spices in a bowl then put to one side. Melt the butter together with the milk and water. Once melted allow to cool until lukewarm then mix with the dry ingredients. Add the eggs, mixing to make a wet batter, then slowly stir in the remaining flour until a soft, slightly sticky dough is formed. Turn out onto a floured surface and knead for 10 minutes. Add more flour if the dough is too wet. Return the dough to a clean bowl, cover the top and allow to rise in a warm place for approx 90 minutes or until risen to twice the size. Shape the dough into a circle, cutting off a few pieces to make bone or skull decorations for the loaf (depending on your modelling skills!). Transfer to a baking sheet then leave the shaped dough to rise for another 90 minutes. Bake in the preheated oven for 40 – 50 minutes or until golden brown*. Make a glaze by combining the orange juice and sugar over a low heat, simmering gently until the sugar has melted (try not to stir the mixture). Once the bread has cooled brush over with the glaze. *Baking time is given for one large loaf. If you have made several smaller shapes (skulls for instance), shorten the baking time and decorate with coloured icing once the bread has cooled. 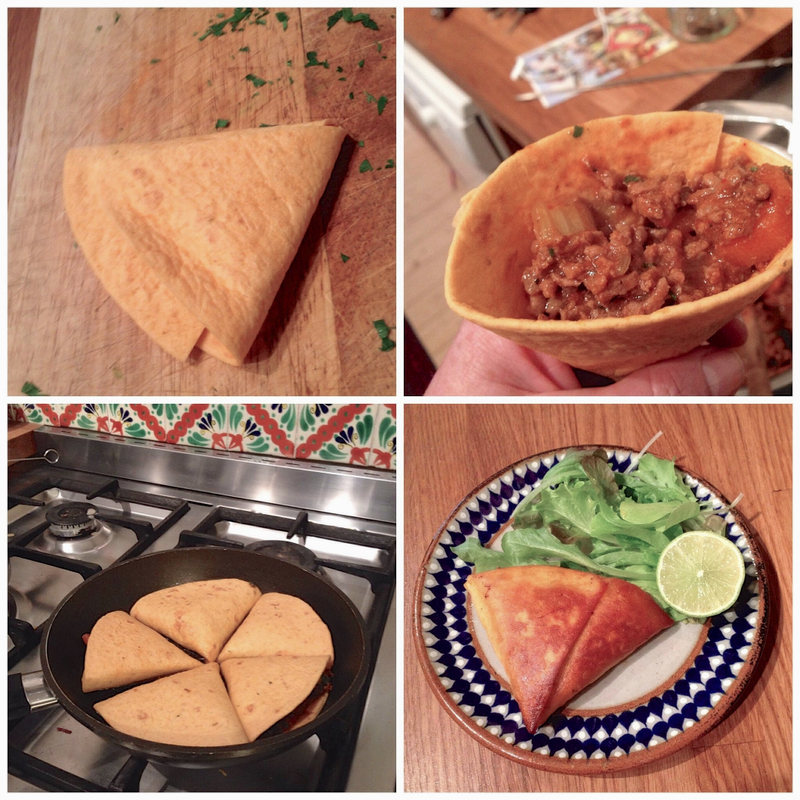 This entry was posted in Day of the Dead, Recipes on November 6, 2014 by admin. 4 ripe avocados roughly chopped, 2 shallots finely chopped , 2 crushed cloves garlic, juice of 1 lime, 1cup tomatoes chopped, fresh coriander, fresh mint leaves, 1 or 2 jalapeños, salt, pepper. Serve with tortilla chips and a cold corona. Summer dinner and no need for plates. 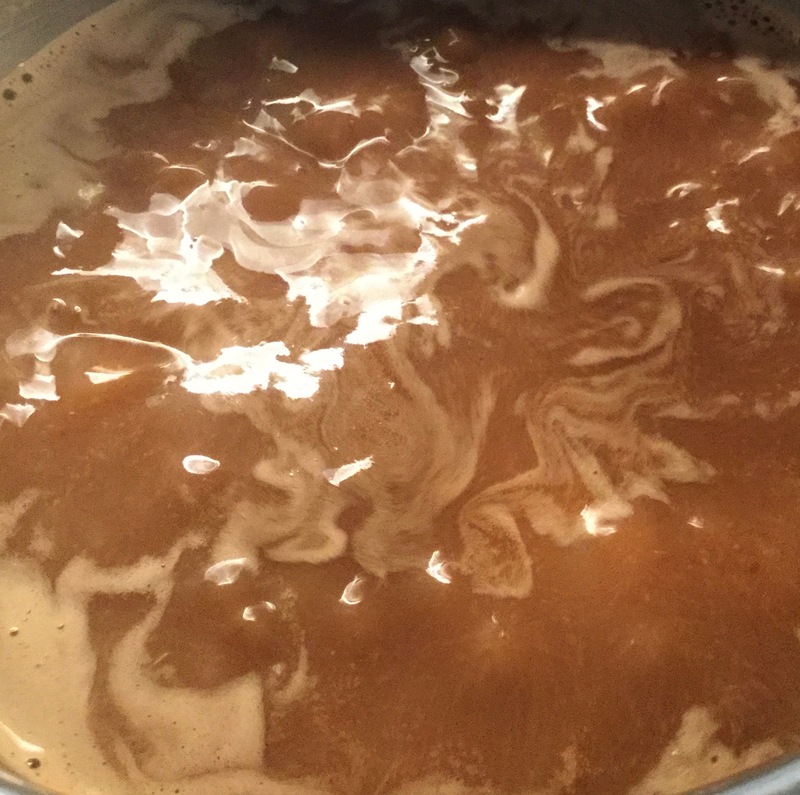 This entry was posted in Recipes on June 23, 2014 by admin. Watching the World Cup is hungry work. 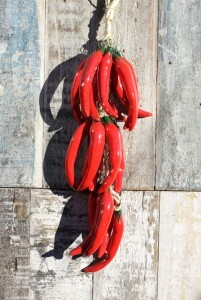 The Caoba team sustain themselves with chillies all year round of course, but during intensive tv-watching sessions it is important to have food to hand without having to break screen/eye contact. Last night’s Mexico v Brazil match was one of those moments. Luckily our Caoba Chilli Wrap, prepared just before kick-off, fended off the hunger pangs as effectively as Guillermo Ochoa fended off that Brazillian header. 1. Make a chilli: steak mince, chopped onion, garlic, tinned tomatoes, chipotle chillies, hot paprika, ground cumin, a tiny touch of cinnamon, oregano, salt and pepper. Cook about 1 hour. 2. Cut corn or flour wraps in half and fold into a pocket. 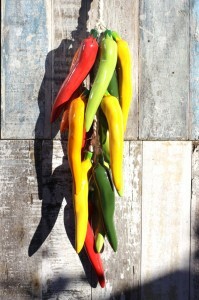 Fill with the warm chilli mix. 3. Heat 2 tablespoons of oil in a frying pan and place the wraps with the seam facing down in for a few minutes each side until they are golden brown. 4. 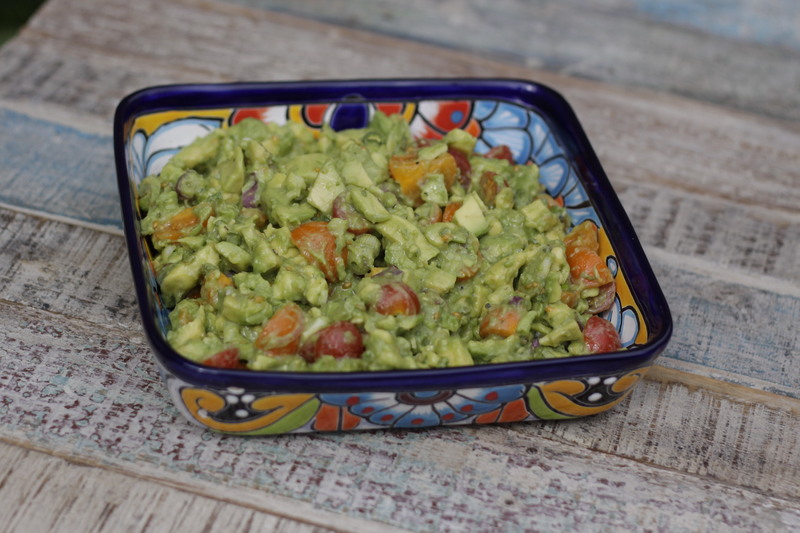 Serve with salad, avocado, sour cream, and a squeeze of fresh lime. And a cold beer. 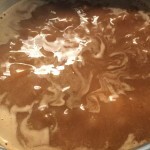 This entry was posted in Recipes and tagged beef, beer, chilli on June 18, 2014 by admin. 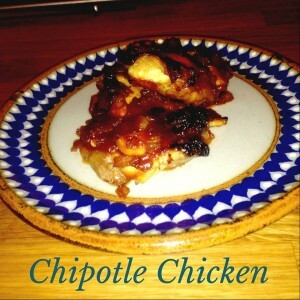 When lacquered with a rich chipotle chilli sauce and roasted, chicken becomes a delicious crowd pleaser. There’s enough chipotle here to make your lips hum, but not so much as to overshadow the other ingredients. Roast in the oven for now, but at the first sign of fine weather reach for the barbecue! Heat the oil in a heavy pan over a medium high heat until it shimmers. Cook the sliced garlic, stirring constantly until golden, then transfer with a slotted spoon to a plate. Reduce heat to medium and cook onions, stirring occasionally, until golden brown, about 15 minutes. Return the garlic together with the remaining ingredients, except the chicken thighs, to pan. Season with salt and pepper to taste and simmer, stirring occasionally, until sauce is slightly thickened, about 25 minutes. Place the chicken thighs in a roasting tin and coat with half the sauce. Roast in the preheated oven for 25 minutes. Remove from oven and brush chicken pieces with the remaining sauce. Roast for a further 20 – 25 minutes or until chicken is cooked through and well browned in spots. 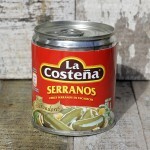 Serve with rice and green beans and a dollop of sour cream on the side. 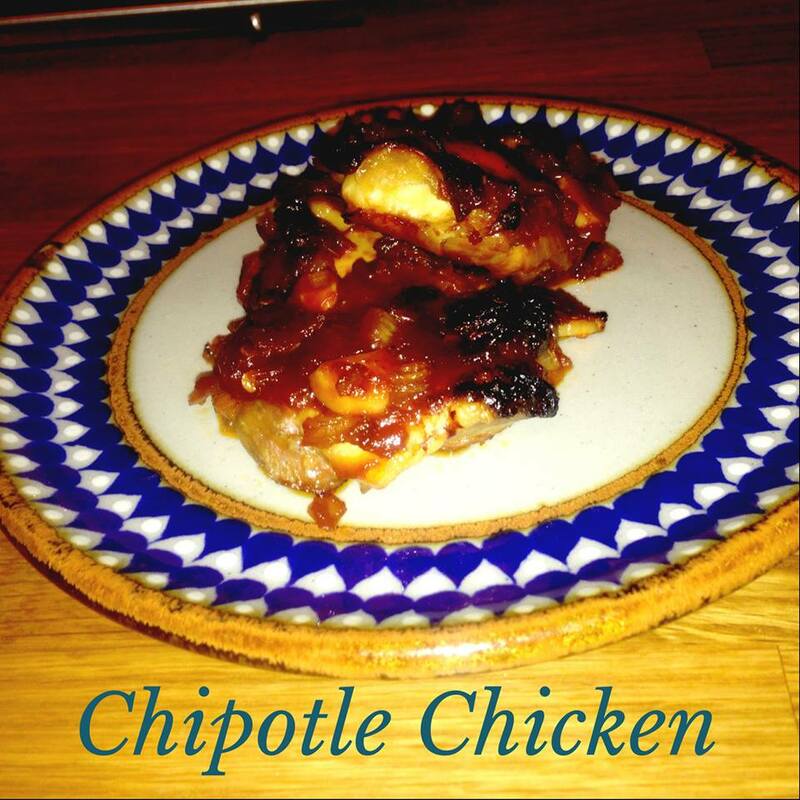 This entry was posted in Recipes on February 18, 2014 by admin. Say Mexican glassware and we all think of the iconic modern margarita glass and the cocktail* that goes in it, but Mexico has a long and honourable tradition of glass-making. Craftsmen brought to Mexico by the Spanish as long ago as the 16th century were the first to produce hand blown glass on the North American continent. 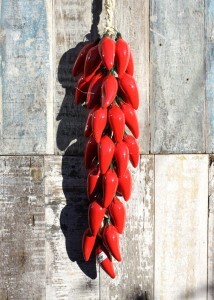 Since then Mexican master craftsmen have given the art of vidrio soplado or mouth-blown glass-making their own flair. In 2001 Caoba began working directly with small Mexican businesses to develop the wide selection of glassware the shop carries today. The skill of glass blowing has been passed down through the generations and today’s workers are fiercely proud of their craft. 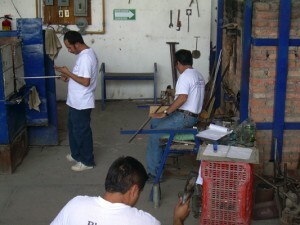 Visiting the family-run glass workshops is always one of the most exciting features of our buying trips to the region. The workshop floor is a hot, all-male environment, full of machismo bravado and humour but none of that detracts from the speed, dexterity and artistry with which these artists work; from molten glass to wine glass in 12 minutes. The vidrio soplado Caoba stocks is all made from recycled glass. Old un-reusable glass such as beer and Coke bottles are saved from the landfill, melted down in the workshop furnaces and refashioned into our unique, eco-friendly Mexican glassware range. 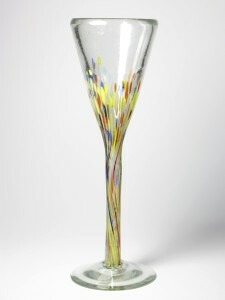 The traditional style blue-rimmed glass is complimented by bright, jewel-like reds, orange and aquamarines, as well as multi-coloured confetti designs, in all shapes and sizes from wine and high-ball glasses to (naturally) the Margarita glass. No one piece of glass is the same as another; mouth-blowing recycled glass means each item will have slight variations in shape and colour with little trapped air bubbles, like frozen champagne. This unique finish cannot be achieved by mechanised techniques. On a practical level Mexican recycled glass is sturdy and dishwasher proof. But be aware, because it is so solid extremes of heat should be avoided. If taken straight out of the dishwasher, let it cool down before piling the ice in and don’t use with boiling water. blow torches they can swiftly pinch out delicate flamingoes, octopus, parrots, lizards and chillies from the hot glass to sit atop cocktail or swizzle sticks. Needless to say, we had to bring these back too. *Yes, we mean the Margarita (Daisy in Spanish). 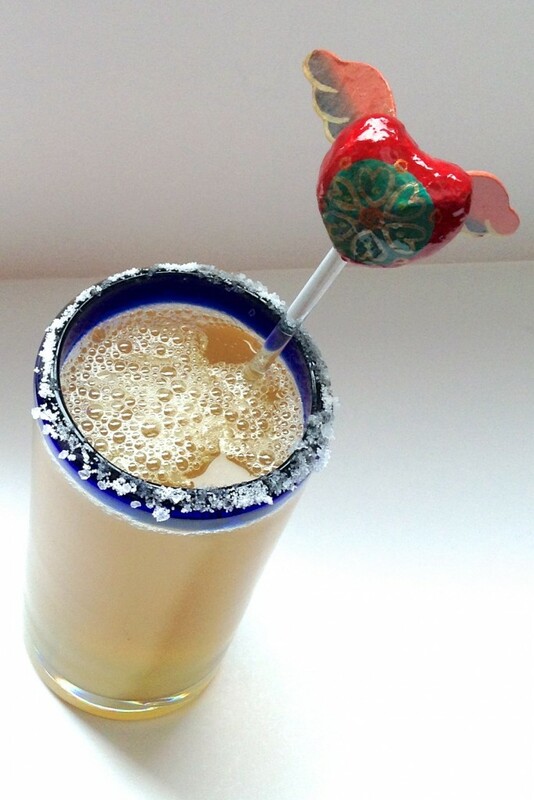 There are many theories and traditions about how the Margarita came into being; my own favourite is the Prohibition-based theory, that thirsty Americans drove over the border and had their brandy-based Daisy cocktail remade with Tequila…. !Ya esta! the Margarita was born (possibly). Rub the rim of a stem glass with the rind of a lemon or lime, dip rim in a shallow plate of salt to coat. Pour the tequila, Triple Sec and juice over the crushed ice in a container and stir. Strain into the glass and enjoy. This entry was posted in Recipes, Recycled Glassware and tagged cocktails, drink, eco-friendly, glassware, recycled on January 5, 2014 by admin. 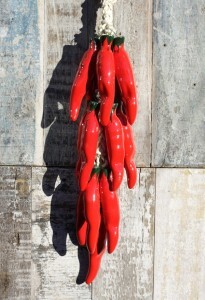 You’ll find no pandering to the newly arrived autumnal weather here at Caoba. We’re still drinking cocktails like it’s a balmy 25 degrees outside. Well I say cocktails but really I mean Mexican beer with the juice of a lime squeezed into it for a sharp, refreshing, Mexican alternative to lager and lime. 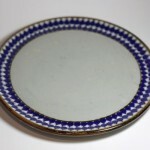 Take one Mexican blue-rimmed, high-ball glass and dampen the rim with water then dip into a saucer of salt flakes (table salt will work just as well), as if you were preparing a Margarita. Allow to dry. Squeeze into the glass the juice of one lime*, two if the lime is small. 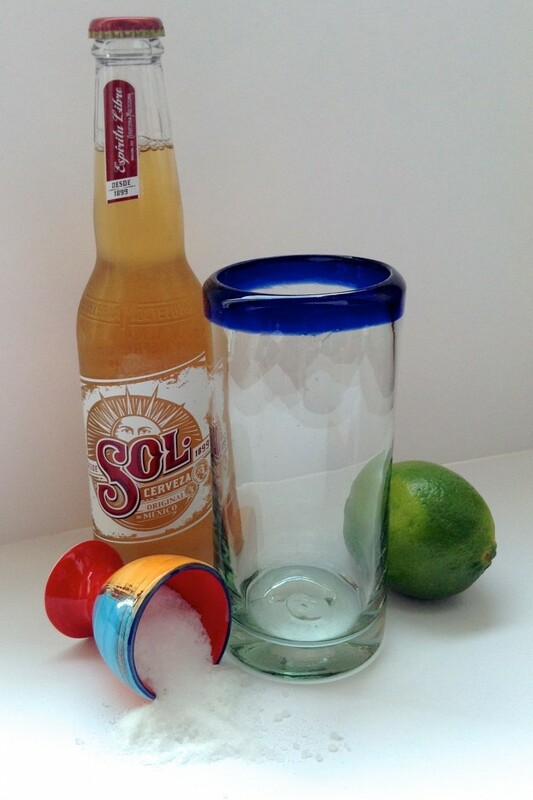 Top up with beer from a chilled bottle of Sol or Corona, stir gently and drink. Responsibly of course. *Insider tip: Before cutting the lime in half, roll it around on the work surface to release more of the juice and/or pop it in the microwave for 10 seconds. This entry was posted in Recipes, Recycled Glassware and tagged beer, drink, lime on September 19, 2013 by admin.